This headrest mounting hardware option offers a removable and height/depth/angle adjustable attachment of a head support pad. The head support pad is attached to the bracket with a ball and socket assembly which enables the pad itself to have angle adjustability. This option can be selected for any head support pad. It is most beneficial when there is the potential to adjust the head support in any or all of three planes ( height and/or depth and/or angle of the pad ) to make appropriate contact with the head. BioDynamics offers a variety of mounting options for headrest pads. Removable Extension Hardware offers vertical height adjustment of the pad selected. 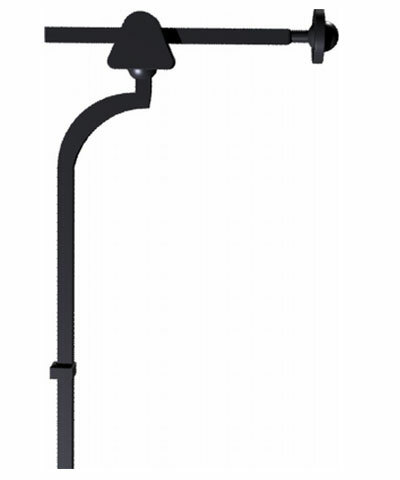 This bracket will allow the headrest pad to be quickly and easily removed by loosening a knob. Removable Height and Depth Adjustable Hardware is made from square, stainless steel stock. The choice of using stainless steel is to prevent rusting as well as offering maximum strength/durability. The square shape prevents rotating of the horizontal and vertical bars. The height and depth of the vertical and horizontal rods, respectively, can be adjusted. The angle of the pad relative to the bracket is fixed. This bracket will allow the headrest pad to be quickly and easily removed by loosening a knob. Removable Height, Depth and Angle Adjustable Headrest Hardware is made from round, stainless steel stock. The stainless steel material will prevent rusting and offer maximum durability. The height and depth of the vertical and horizontal rods can be adjusted as well as the angle of the pad relative to the bracket. This bracket also allows the headrest pad to be quickly and easily removed by loosening a knob. Flip-Down Height, Depth and Angle Adjustable Headrest Hardware is made from round, stainless steel stock. The stainless steel material will prevent rusting and offer maximum durability. The height and depth of the vertical and horizontal rods can be adjusted as well as the angle of the pad relative to the bracket. This bracket flips down with the pull of a spring loaded pin. Selecting this option gives the caretaker the benefit of moving the headrest pad out of the way for transfers, etc., while keeping it attached to the chair. This is beneficial for loss prevention.